Taganrog - Psara, Greece: reviving the historical relationship. 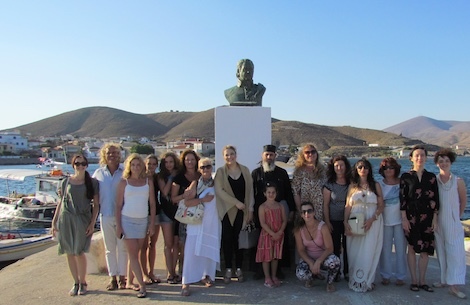 September 17, 2017: representatives of the National Cultural Autonomy of Greeks from Taganrog traveled to the island of Psara, Greece - homeland of Greek national hero Ioannis Varvakis. He is known as one of the greatest benefactors in the history of Taganrog. Ioannis Varvakis settled in the city around 1812, and financed the construction of Greek Monastery, founded two hospitals, donated large sums of money for poor children's education and other charitable causes. Mass in front of Varvakis bust on Psara beach. Yekaterina Revko-Linardato. 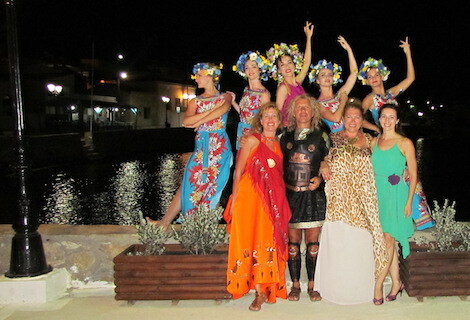 The delegation from Taganrog was invited to visit Psara - the home island of Ioannis Varvakis, within the framework of the international festival "Varbakeia". Among its participants were the artists of Literary theater "Odeon" headed by Anatoly Bozhenko, dancers of the Modern choreography theater "Zodchie" headed by Valeria Drobyazkina, and the soloist of Rostov Philharmonic Society Gayane Dzhanikyan. Inhabitants and visitors of Psara had an opportunity to listen the poetry of Anatoly Bozhenko recited in Russian and Greek languages by Ayna Bozhenko, enjoy the choreography of Russian dancers and the soprano voice of the Honoured Artist of Ingushetia Gayane Dzhanikyan. 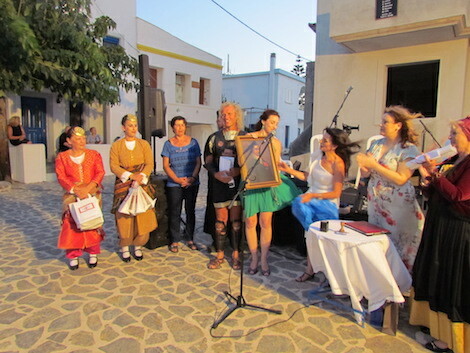 She sang not only on the festival's stage, but also, at the request of the local people, during a mass held at the magnificent St. Nicholas church, and in front of the Varvakis bust on Psara's beach. Copy of Varvakis portrait from Taganrog museum presented to the Greek side. Yekaterina Revko-Linardato. The official greeting letter signed by Mr. Alexander Khomenko, director of the Russian center of science and culture in Athens, was read out in front of the audience to highlight the important role played by Ioannis Varvakis in Greek and Russian history. During the visit researchers from Taganrog had a chance to get acquainted with numerous original documents and unique objects related to Ioannis Varvakis and his family. This information sheds the light on less known pages of Taganrog's history and its historical ties with Greece. Delegation from Taganrog. Yekaterina Revko-Linardato. Within the framework of the visit, Municipal Government of Psara Island, Cultural and education society "Konstantinos Kanaris" and the National Cultural Autonomy of Greeks from Taganrog signed a three-party sistership agreement to extend further cooperation between the municipalities.